I must confess to being a bit of a train geek. I find everything about them rather fascinating; from the excitable atmosphere of busy stations, to the big clocks hanging from high ceilinged railway halls that make for strangely intimate meeting spots across the world – and the people, oh the people watching on trains is a favourite past-time. My favourite train is the Eurostar, and so it felt like an appropriate way to begin our overland adventure to Vietnam six months ago. There’s something rather Parisian about the whole affair; champagne and air kissing under the huge arched ceiling of St Pancras – and when you cross through to departures you can’t help but feel like you’ve discovered a whole new side of the train station that is invisible to commuters. It’s nothing short of marvellous. And don’t even get me started on the fact that really it’s like a giant submarine that’s hurtling along the ocean. If only they’d put a few windows in the tunnel for a spot of marine watching. No train, I thought, could surely be better than the Eurostar. For no other train is taking you to the fairytale land of Croissants, bloody steaks and fine Bordeaux. 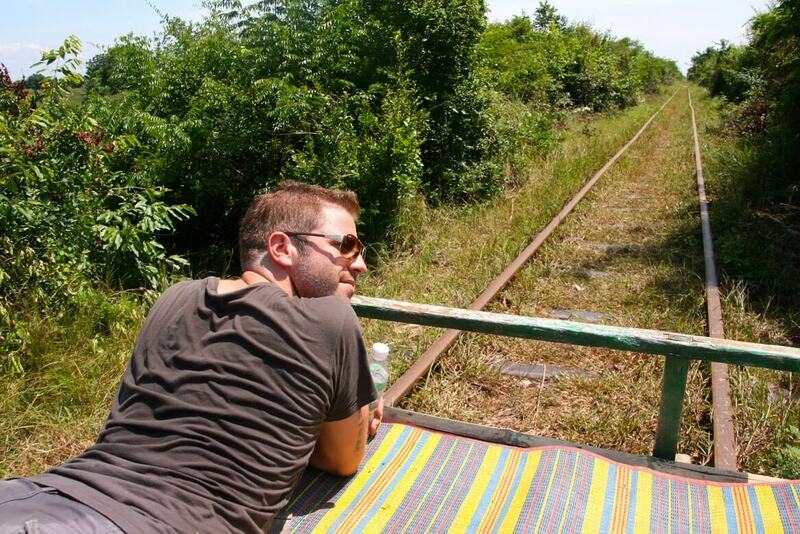 But, the other day I caught a train in Cambodia that forced me to re-evaluate. Well I say ‘caught a train’ as if it was taking me somewhere but it wasn’t, not really. 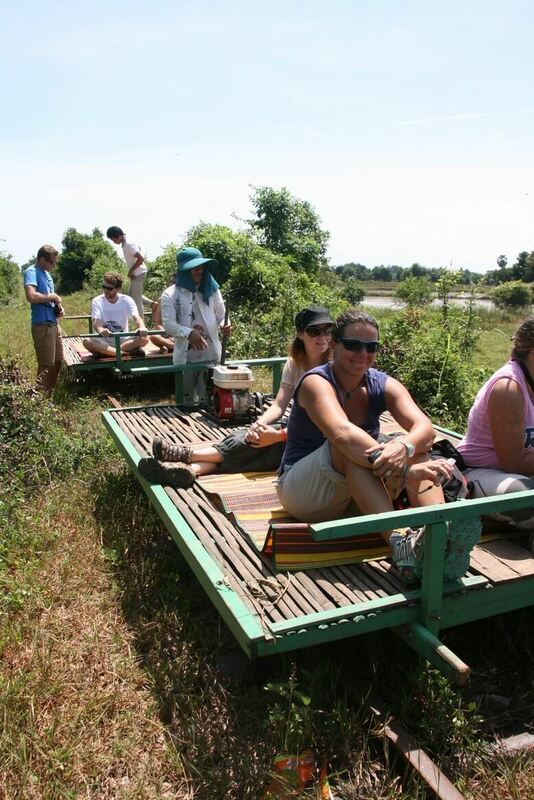 See there are no passenger trains in Cambodia. The streets are heaving with tuk-tuks and motorbikes but there is not a train in sight. What do you mean this doesn’t look like a train?! Well, apart from the Bamboo Train that is. 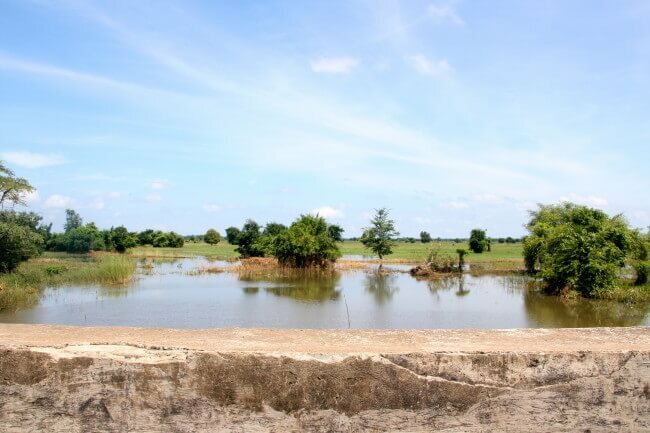 Hidden off the main tourist trail is a charming little town in the northwest called Battambang (not to be confused with the cake). No Battambang is far more delicious than Battenberg. And rather randomly, its claim to fame is the bamboo train. The bamboo train is basically a bamboo raft with a lawn mower engine stuck to the back of it that hurtles down wonky train tracks that are kind of parallel. You pile onto the ‘carriage’ and then sit back and let the ‘train driver’ do the work. And I can honestly say it was one of the most fun things we’ve done on the trip so far. I am actually a little lost for words – it’s just hard to sum up being ‘rafted’ across what looks like a disused railway at 50 mph. Every now and then when the rails looked particularly rusty we would be jolted forwards and clutch the little piece of wicker carpet laid under us a little harder. But then in the horizon we saw oncoming traffic. Hurtling towards us on the same narrow track was another little bamboo raft carrying some bemused tourists. Slowly we all ground to a hault and stared at each other slightly bewildered. This was a bit different to the country lanes near my parents’ house where a hardball stare is enough to send the other car reversing 100 yards back to the nearest ditch. Just as I was about to give my best ‘back up, love’ look our ‘train driver’ motioned for us to get off. Within seconds our carriage (which rides the rails on a pair of dumb-bells in case you were wondering) was dismantled piece by piece and lying on the side of the railway. STEP ONE: Remove the carriage from the tracks, piece by piece. STEP TWO: Let the traffic pass and then get bemused tourist to try and put the carriage on backwards. We were off again. Off where exactly I’m not sure. 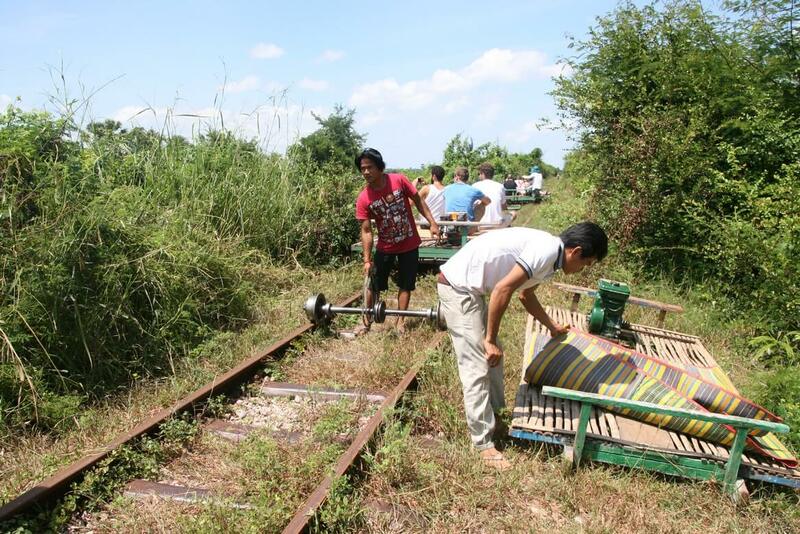 The tracks were laid in the 1930s in French colonial times but all the trains were destroyed by the Khmer Rouge in the 1980s, which led local people to construct the bamboo trains using traditional methods to help get them into town easier. While the trains are still used by some locals today, they have been largely replaced by the growing number of vehicles on the road. But for us it was definitely all about the journey rather than the destination, as we ended up an hour later where we had begun. But as far as train rides go I think this may just have been the most memorable. A ride with a view. 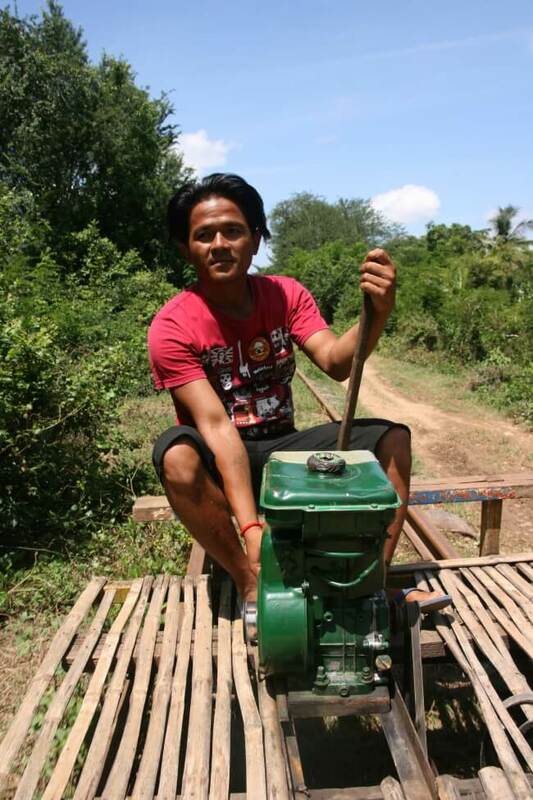 This entry was posted in Cambodia, Recent Posts and tagged Trains, Travel by Delia. Bookmark the permalink. That’s… That’s… I don’t even know whether I’m leaning more toward insanity or awesomeness!